MSLL Opening Ceremonies will take place on Saturday April 6th at ~11.45am. Teams should gather with their coaches in the water park area in front of the concession from 11.30am. The parade will be led by a bagpiper. The Majors teams will follow the bagpiper and then other teams should follow along behind them. Teams will parade in the following order – Majors, AAA, AA, Challenger, Rookie Senior, Rookie Junior and Rally Caps (if any of our Juniors or Seniors/Bigs teams choose to attend they can follow directly after the Majors teams). Coaches should participate in the parade with their players. The parade will follow the path towards the RJ diamond and then back towards the Majors field to enter via the left field gate. 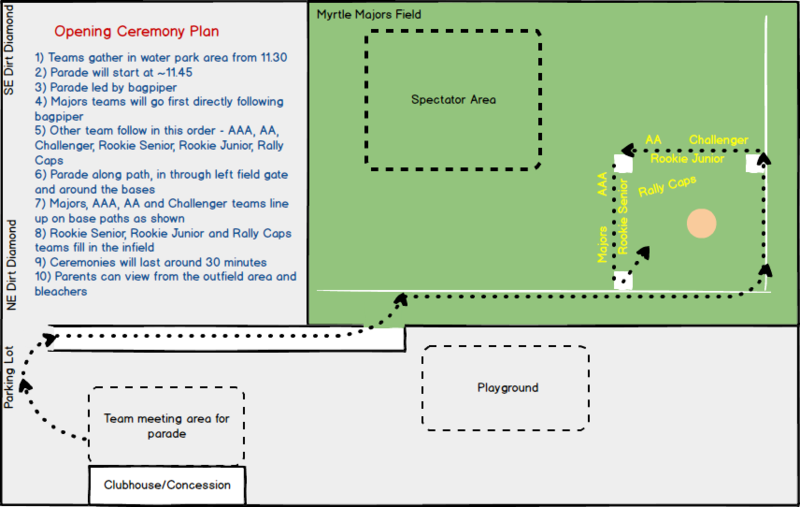 Teams will then parade around the bases before lining up along the base paths and in the infield area (see map below for meeting area and parade route). Once all teams have entered the field the ceremonies will take place consisting of welcoming remarks, the Little League pledge, the singing of our national anthem and finally a ceremonial first pitch. The ceremonies should take approximately 30 minutes. Parents can watch the parade and ceremonies from the Majors bleachers and outfield area. Attendance of the opening ceremonies is optional – but it would be great to see lots of teams there. Keep your fingers crossed for good weather – we will only cancel the ceremonies in the case of extreme weather.